Employers have a crucial role to play in destigmatising mental health issues. But they can only do this by creating workplaces, where it is ‘safe’ to talk. Where it’s ok to not be ok. There are some fundamental building blocks needed to create this environment and perhaps first of all is leadership. Leaders set the tone for an organisation so they need to be talking about mental health and setting the standards. They need to normalise mental health through their leadership and provide the strategic direction for the delivery of activities to support mental wellbeing. The manager is key too and I have written about the role of managers in supporting mental health in the workplace. Managers are in a great position to be able to identify signs and offer support but to do this, they need to have clarity about their role in supporting mental health in the workplace, understand the signs and symptoms to look out for, and feel confident to have conversations about mental health. Communications are vital and the employer needs to proactively share what is available and use language which normalises mental health. This, however, can be undermined by the dialogue which is taking place in the workplace – whilst a company may offer counselling, an individual’s willingness to access such support will be minimised if derogatory language is tolerated in the working environment. This needs to be challenged, but also, employees need to have access to mental health awareness training which gives them the insight and understanding needed. Employers also need to consider their policies and procedures – are they giving opportunity for conversation or are they too directive? By having HR processes – such as 121s – which give equal opportunity for manager and employee to speak will help to build an ongoing conversation. The organisation can also demonstrate that this is a safe place to talk by making commitments – to Mindful Employer, or to Time to Change, or indeed through their own organisational values. This is a loud and clear sign that the employer supports its people talking about their mental health. And companies also need to think about what else they can offer – where they can signpost and guide an employee for support, to occupational health or talking therapies, for example. Because once an employee starts to talk, an employer needs to be ready. 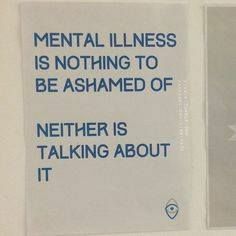 People need to feel empowered to talk about their mental health. And employers have a great opportunity to support them to do this.